Everyday is for the thief , one day is for the owner. 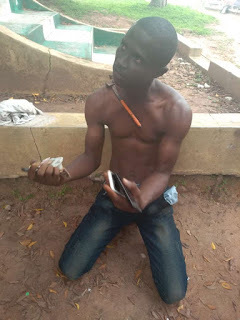 That's the case of a young unidentified man who was caught with stolen phones today at Adenike , LAUTECH student area . Speculations have grown that he's linked with the multiple robberies at Under G but no confirmation has been made yet but police has promised to put him under proper investigation . We therefore urge everyone to be security conscious of their surroundings and watch out for strange faces around .